Can you sue an “authorized treating physician” for medical malpractice? Disputes about quality medical treatment in a Georgia workers’ compensation case generates a great deal of litigation and arguments between claimant’s lawyers and insurance defense lawyers. From the claimant’s perspective it seems as if employer/insurer recommended doctors seek to minimize symptoms for the purpose of returning injured claimants back to full duty work status. 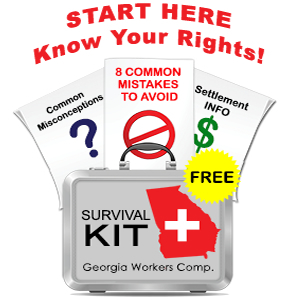 As discussed elsewhere on this web site, you have several options within the Georgia State Board of Workers’ Compensation rules to seek either a second opinion or a change in the authorized treating physician. Does Georgia Workers’ Comp. Law Provide Malpractice Immunity to Authorized Treating Physicians? But what happens if any of the physicians you see – any “authorized treating physician” who appears on the posted panel of physicians or who is otherwise deemed authorized – causes you serious harm. Does Georgia workers’ compensation law stop you from pursuing a medical negligence case against your doctor? The simple answer is “no” – there is nothing in the Georgia workers’ compensation law that prevents you from pursuing a medical malpractice lawsuit against a truly negligent physician whose malpractice has caused you harm. Over the years, I have represented several workers’ compensation claimants who suffered injury and who did pursue malpractice claims. Malpractice is malpractice and the liability from tort liability that protects employers does not extend to workers’ comp. physicians. Medical malpractice cases that arise from workers’ compensation claims do create some unusual issues, and the timing of both settlement and pursuit of the negligence claim can be important. Specifically I have seen situations where the insurance company threatens to “subrogate” its claim – which amounts to a demand that you reimburse the insurance company for medical costs that were also paid in the negligence case. Each one of these joint workers’ comp and medical negligence cases brings its own challenges which I address on a case by case basis. I will tell you that proving medical negligence in Georgia is difficult. Despite what insurance companies and “tort reform” advocates claim, there is no malpractice crisis, at least not in Georgia. Under state law, any complaint for malpractice must be accompanied by an affidavit (sworn statement) from another physician asserting that medical negligence has likely occurred. Further, the cost of pursuing malpractice cases is such that reputable plaintiff’s lawyers only accept legitimate cases in which severe harm was done. If you think that malpractice has occurred in your case or perhaps to someone you know, please call me or email me – I am happy to evaluate. I maintain a small but active medical negligence practice – some of these clients came from my workers’ comp practice and some who were referred directly to me.